Some children's 'difficulties' do not present in an obvious way, which makes diagnosis problematic, and access to help unforthcoming. This was the experience of Sandy Row, who, after a decade of misdiagnoses and unsatisfactory explanations for her children's struggle in mainstream school, realised that her children had special educational needs (SEN) and began her long quest for help from the SEN system. Row's testimony illustrates how the special educational needs system works and empowers other parents to demand help for their children who have special educational needs that require attention. This frank and practical book challenges the theoretical and often impenetrable established literature on SEN, and instead provides an accessible and effective resource for those needing advice and answers about their rights to services and help for their children. - Support Worker at 'Jack's' Special Needs College who is also a mum of Asperger's son herself. Acknowledgments. Introduction: Why you need to read this book. 1. Starting out: Don't be daunted. 2. 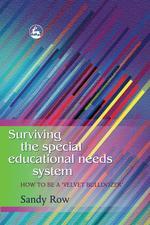 So how do you know when your child has special educational needs? 3. So what does a Statement of Special Educational Needs look like? 4. The Final Statement. 5. So how do you go about getting a Statement? 6. The tribunal, SENDIST and appealing. 7. Preparing for the second tribunal. 8. Alice's story. 9. Alex's story. 10. Richard's story. 11. More of Richard's story. 12. Tribunal II: The Mummy's Revenge! 13. Jack's story. 14. Frequently asked questions. 15. A bit about us. 16. Special needs children who are officially adults. 17. And in conclusion. Appendix: Useful contacts and other information. References. Index.